R. J. TOOMEY CO Round Neck Surplice for Altar Servers and Seminarians. 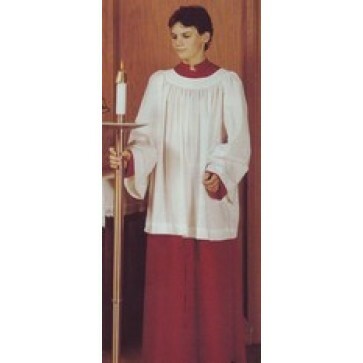 -- Please Select --Age 6 - 17"Age 8 - 19"Age 10 - 21"Age 12 - 23"Age 14 - 25"Age 16 - 27"Age 18 - 29"
The Round Neck Surplice by R.J. Toomey Co. is sized to fit young Altar Servers and Seminarians. The surplice is cut 3 inches longer than the #895 Round Neck Surplice. The vestment has a full cut and is carefully stitched for long lasting use. The #875 Round Neck Surplice is made of a cotton and polyester permanent press broadcloth for easy care. See the alternate images for a sizing guide to order the correct fit. Please call our customer service team for assistance ordering surplices or other church goods.